Togoland was originally a German colony in the west of Africa, until 1914, when it was divided up between France and Britain who attacked from both sides. After the war, Britain and France where awarded mandates to govern the territories they had carved up. So, now, German Togoland became French Togoland, and British Togoland. After the Second World War, British Togoland voted to join the British territory of the Gold Coast to become the new nation of Ghana, whilst French Togoland remained an autonomous state within the French Union. Togo finally gained its independence formally in 1960, under Sylvanus Olympio. However, he was overthrown in a military coup in 1963, only for another coup to follow in 1967. This brought Eyadema Gnassingbe to power. He ran Togo as a dictatorship from 1967 to his death in 2004. Through all this time the flag had not been changed. 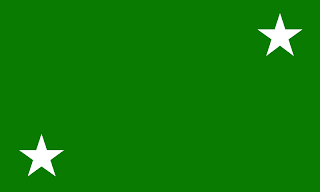 The first flag of Togo saw a plain green field, with the French tricolour in the upper hoist of the flag. In the lower hoist, and the upper fly corners, they placed 2 white stars. This flag was in use from 1957 to 1958. Then, from 1958 to independence, the territory dropped the French tricolour from the flag. The flag flown from independence was designed by Paul Ahyi, an artist. It took the colours from the Ethiopian flag of red, yellow, and green. The flag itself was inspired by the flag of Liberia. 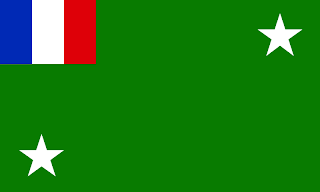 In the upper hoist canton is a red square featuring a white star, and the rest of the flag features 5 stripes of green and yellow running horizontally. The yellow represents national unity, whilst the green represents hope. The red represents blood spilt in the past, and to be spilt in the future, and the white in the star represents the hope to live in peace and unity. 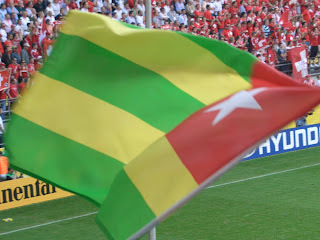 The star itself represents the liberty of Togo, and the 5 stripes represents the nations desire to always be a vigorous nation.